Graphics card (GPU)?Graphics Processing Unit calculates 3D graphics and is essential for gaming and heavy programs. 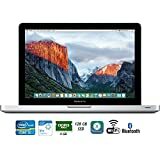 he 11.6" MacBook Air Notebook Computer from Apple is an ultraportable notebook computer with a thin and lightweight design. Apple's engineers have leveraged the lessons they learned in designing the miniaturized iPad and applied them to the design of this 2.38-pound computer. 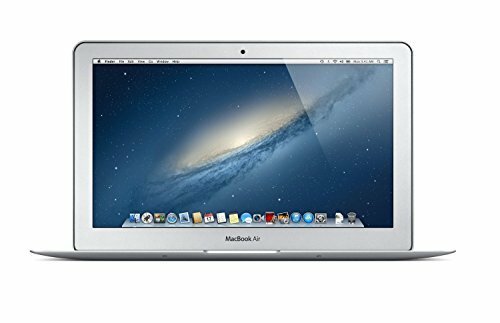 4th Generation Haswell Intel Core Processors MacBook Air is powered by the fourth-generation Haswell Intel Core i5 processor. This ultra-efficient architecture was designed to use less power and still deliver high performance. This means not only can you do whatever you want - you can keep doing it for longer than before. In addition, the new Intel HD Graphics 5000 offers up to 40 percent faster graphics - performance you'll especially notice with games and other graphics-intensive tasks 802.11ac Wi-Fi: Three Times Faster MacBook Air now supports ultrafast 802.11ac Wi-Fi. When connected to an 802.11ac base station - including the new AirPort Extreme and AirPort Time Capsule - wireless performance is up to 3x faster than with the previous generation of MacBook Air. And your Wi-Fi range improves as well. With Bluetooth technology, you can connect MacBook Air to Bluetooth-enabled devices like speakers and headphones A Display of Excellence Corner to corner and pixel by pixel, the MacBook Air display is both an engineering feat and a design breakthrough. The display measures a mere 4.86 millimeters (0.19 inch) thin, yet its resolution makes you feel like you're looking at a larger screen. The 11.6" MacBook Air features a native resolution of 1366 by 768 pixels. And LED backlighting makes colors bright and vibrant from edge to edge 720p FaceTime HD Camera Let your friends and family see more of you with the 720p FaceTime HD camera. Renewed products look and work like new. These pre-owned products have been inspected and tested by Amazon-qualified suppliers, which typically perform a full diagnostic test, replacement of any defective parts, and a thorough cleaning process. Packaging and accessories may be generic. All products on Amazon Renewed come with a minimum 90-day supplier-backed warranty. 11-Inch LED-backlit Display with build in 720p FaceTime HD Camera; 1366x768 Resolution; Intel HD Graphics 5000.